Continuum Lite for Avid (“BCC Lite”) includes 4 popular, powerful, and high-performing filters from Continuum 11’s plug-in collection. 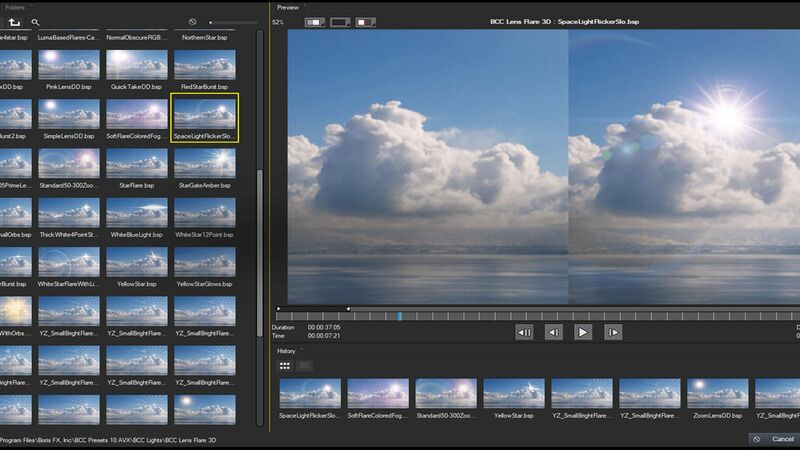 These useful filters were hand-picked to give you a chance to experience common features found in the full Continuum package which features over 230 filters. Deliver higher production values than ever before. Continuum Lite is a great “starter” pack for those who need the power of a professional visual effects solution but want to experiment with VFX first. The four Continuum filters included are perfect for learning basic VFX techniques in preparation of stepping into the full set. Enjoy Continuum Lite created by the team at Boris FX. Avid editors with an existing license of Continuum 10 are eligible for the upgrade price to Continuum 11 for $495. Continuum 9 owners are eligible for the upgrade price to Continuum 11 for $695. Subscription pricing options are also available. Lens Flare 3D is a powerful lens flare designer and animator with tools to create optical flares from realistic to the supernatural. Features include: light flicker, auto-shimmer, lens obscuration, motion tracker, and beat reactor. Design your lens with rays, fog, polygons, disks, hollows, faded rings, stripes, chroma hoops, chroma fans, elliptical and star caustics, texture orbs, lens dirt, and chromatic aberration. Your creative options are endless. Scanlines is a versatile visual effect for adding popular analog equipment artifacts you won’t find in digital video. Easily recreate the rolling scanlines of classic TV screens. Add realism with the user-controlled noise generator. Limit your scanlines to a specific area or track them to a screen in a moving shot using the new PixelChooser powered by Mocha. Colorize is a powerful, yet simple way to create color looks within your Avid timeline. Use a gradient of up to 6 colors to quickly tone an image for a more desirable or artistic look. Easily isolate your color treatments to specific areas using the new PixelChooser powered by Mocha. The Swish Pan transition is one of the most popular transitions in the Continuum package. The quick, fully automatic, drag-and-drop transition emulates the cinematic look of a fast camera pan between two shots. New overly adjustment curves allow you to fully control the ease-in and ease-out points making the Swish Pan transition a real stand out. The PixelChooser™ is an important NLE aid for applications where native masking tools are not available or not linked with the effects palette. The powerful feature, found in most Continuum effects, lets you quickly create a moving matte by choosing pixels based on their geometric position, color or luma. The PixelChooser has been newly redesigned for the most recent Continuum release (v11) and is now easier to use and more feature rich than ever before. The newly integrated (and Academy Award-winning) Mocha planar tracking and masking system lets you create even more advanced VFX right alongside the PixelChooser. Quickly track your mattes across multiple frames — a serious timesaver for busy editors on tight deadlines. You now have access to the same Mocha tracking and masking toolset used by the world’s top VFX artists on practically every feature film. Looking to make your VFX bounce to the beat of music? The Beat Reactor will save your hours of painstaking keyframe creation. Simply import your AIFF file, choose the audio band you want to sample using the overlay frequency graph, and customize effect parameters driven by the beat. The FX Browser™ is a welcome addition to the Continuum product line and is included in the four Continuum Lite filters. The highly-customizable FX Browser™ window features a mini-timeline for playing back fully animated presets. Really liked one specific preset but can’t remember what it was? The built-in history panel tracks your browsing history so you can quickly go back to your favorite effects. Never lose a moment in your VFX workflow.